Charleston Voice: Confederate Flag In Citadel Chapel Has To Go Or NAACP Will "Intervene"
Confederate Flag In Citadel Chapel Has To Go Or NAACP Will "Intervene"
It was the just new head of the College of Charleston, Lt. Gov. Glenn McConnell, when as a SC Republican state senator, who caved-in ("compromised") in taking down the state flag from atop the state capitol dome in 2000. He and his GOP neocons obliged his comrades of the Left, many bussed-in from out of state. Every state's got 'em in the Glenn mold. SC leads all others in political corruption - graded "F"! 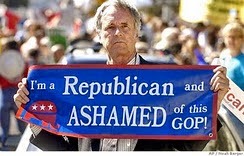 ....McConnell was part of the compromise team that removed all four of those flags, replacing them with one infantry flag on the soldiers' monument. As a part of that deal, in 2000 South Carolina became the final state to recognize Martin Luther King Day. People had tried and failed to recognize the holiday in this state for 20 years. George Washington is BANNED from the MLK Day event held today in South Carolina. 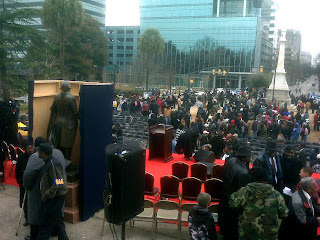 Note the wall built around the Chief Founding Father at the event held on the steps of the Capitol Building in Columbia, South Carolina. By now most of you have probably read about the big fuss over the Confederate Navel Jack that has been hanging in the Summerall Chapel at the Citadel in Charleston, South Carolina. It’s been hanging there for several years, with never a problem, until Charleston councilman Henry Darby decided it had to come down. Supposedly, Mr. Darby was approached several months ago by two of his constituents who were concerned about a Confederate flag hanging in the chapel at the Citadel. It seems that neither Mr. Darby nor his constituents feel that flag should be in a chapel. Why in Heaven’s name not? It is, after all, with its Cross of St. Andrew, a Christian flag. But, we have the usual “reasons” thrown out there–well you know it’s “racist” and all that, and after all the KKK carried it in parades, and so on and so forth. The KKK carried the US flag in lots more big parades than they ever carried the Confederate flag in, so, by this reasoning, we should also ban the US flag, right? Well, not quite. We have to be selective in what we ban. In other words, if it represents Southern heritage and culture, then let’s get rid of it. All else gets an automatic pass. Turns out that the state’s attorney general has stated that the Confederate flag in the chapel is protected under state law, in its present location, by the Heritage Act, as a “monument or memorial erected on public property of the state.” The attorney general has ruled as much. Mr. Darby had proposed cutting $975,000 from the money given to the Citadel to help pay for the restoration of their sports stadium. Looks like with the attorney general’s ruling in favor of the flag, the Citadel will get that money. Darby said he was afraid this would happen, and so he said if it did, he would then be forced to ask the South Carolina division of the NAACP to step in. The NAACP has had its long nose wrapped around the Confederate flag in South Carolina for over a decade now. It hasn’t, thankfully, done them as much good as they hoped it would, but it seems that they just don’t know how to quit. There may be a lesson there for Southern Heritage activists and other patriots. Too often some of us tuck tail and run after the first time we lose a skirmish. The Left doesn’t. If they lose they just keep on keeping on until they wear down their opposition. This is the same game they played with the Confederate flag over the State House–just get it down where no one can see it. So it came off the flagpole atop the State House and was put on a much lower flag pole elsewhere, which the complainers agreed do, and after awhile they complained about the new location too. What they really want is for all Confederate flags to come down everywhere, but they are willing to take a Fabian approach with that and do it gradually because they count on our short memories. At some point, you are forced to ask the question–who are the real “racists”? Seems to be that those who are not willing to let others display the symbols of their culture and heritage, but want them all removed, are much more “racist” than those who don’t. But let’s don’t kid ourselves. This is nothing more than Cultural Marxism being used to attack the South and its heritage and it’s long past time that we started to fight back.